Launch Audio / Music Streaming Service instantly! Looking to launch your own branded Audio Streaming Service like Spotify? Look no further, with Muvi you can now own & launch your own branded audio or music streaming service and stream audio or music tracks across multiple devices instantly! Launch from Music Streaming to podcast, from audiobooks to inspiration talks, all using one single platform! Muvi takes care of it all, from IT Infrastructure, CDN, cloud based servers and storage, security, payment gateway integration, subscriber, Billing and User Management, Reports & Analytics to website and apps, you get it all, a fully managed end-to-end solution from Muvi all integrated and ready to launch in 1-click! Launch an Audio Streaming Platform instantly and start broadcasting to the world in 1-Click. Muvi provides you everything you require to launch and run your own Audio Streaming Platform across multiple devices. You can launch a platform like Spotify or Audible with Muvi, while we provide the end-to-end technology, you take care of the content and marketing to rake in the revenues (oh, BTW 100% revenues belong to you!). You can be up and running your own broadcast network in under just a couple of hours, as everything you need from IT infrastructure to Website and Apps for Mobile is provided and taken care by Muvi, all out-of-the-box! Muvi’s Audio Streaming Platform supports audio tracks in multiple formats, from MP3, WAV, ACC to Ogg, we support it all, so that you don't need to worry about converting your audio library from one format to another trying to make your audio tracks compatible with an platform, we make our platform compatible to your audio library! The Muvi platform supports live streaming of audio content. Not just streaming from your library, your users can stream audio content that's running live such as a concert, coverage from a recording studio, jamming sessions of a band, radio room discussions, etc. Once you have uploaded an existing audio feed in the Muvi CMS, users will be able to stream it live from the website. When you chose Muvi as your streaming partner, you get a 100% white label offering, all the websites and apps that you deploy using Muvi will bear your name and your logo and will have no mention of Muvi! Even the apps are deployed on app stores under your user id and brand identity so that your users and listeners connect with you and belong 100% to you! Get an IT Infrastructure that is trusted by the likes of Netflix and Spotify to host your audio streaming platform! Yes, you read that right, Muvi uses the same IT Infrastructure provider - Amazon Web Services (AWS) that hosts and streams popular streaming businesses like Spotify and Netflix! Dont settle for anything else that compromises on the IT infrastructure to provide a cheaper service. Muvi provides you with cloud based hosting, storage, database server, transcoding server, firewall, streaming server and CDN all out-of-the-box, backed by unlimited and free storage* as well as endless bandwidth that meets your listeners demand, our enterprise offering comes with auto scale up architecture that supports unlimited listeners and scales up automatically with the number of users on your platform going up, to infinity! Muvi’s Audio Streaming Platform supports multiple monetization models. You can offer and run Subscription based services as well as Transactional where listeners can purchase a single track or entire album. You can run Advertisements and offer your services for free to end listeners or run multiple monetization models which offers everything! Muvi also offers a coupon and voucher engine via which you can run discounts and offers via coupon codes offering flat % discount or cash discount, as well as club your audio track or album with other services and offer it free via Vouchers! The Audio Streaming Platform provided by Muvi not only comes with a pre-built and ready to launch responsive website that works across all devices, but also with the option to launch your audio streaming platform on devices such as Mobile phones & Tablets running on iOS and Android ecosystems. Muvi provides Native Apps, all built, hosted, managed and maintained by Muvi under your brand name! Take your platform to multiple devices instantly with our ready to launch platform! Muvi provides you with an option to select an audio-only or audio-video template from our list of pre-built templates for your audio streaming platform. The pre-built templates make it very easy for you to simply add your logo and go-live instantly, or if you prefer you can select a template and use our template editor to customize it as per your needs! Don’t like what you see? In that case, you can opt for our BYOD template editor and ask your designers to build a completely new template from the ground up, as per your needs and brand guidelines and integrate it with Muvi! It’s as simple as doing a WordPress template which gives you more power and control over how your platform looks and feels as well as the ability to change anything you want, instantly, without having to approach Muvi for help. Muvi delivers a stunning Audio Streaming Platform due to the all-in-one Content Management System it has developed in-house all from the ground up, which integrates the entire workflow management of Adding and Publishing an audio track across multiple devices seamlessly and integrated. The all-in-one CMS lets you control everything from a single dashboard, from IT infrastructure, to Payments, Billing & Invoicing, from audio track metadata and publishing, everything happens centrally from a single admin panel, you don't need to login or logout of any other system. Muvi is fully equipped to handle and defend your platform against all types of cyber threats that currently hamper huge losses to the industry. Muvi keeps your contents safe by encrypting the audio files thus preventing them from being captured or leaked out, to keeping at bay the numerous audio download softwares and add-ons currently available in the market. Muvi conducts a host of tests regularly like Penetration Testing & Security Audits to ensure high level of protection and has 24x7 security monitoring of the infrastructure to fend off attacks like DDoS attacks. Muvi supports out-of-the-box integrations for leading payment gateways from across the world like Adyen, Stripe, PayPal, Authorize.net, FirstData, InstaFeez, WorldPay, Braintree, Paygate etc… this ensures no matter where your merchant account is or where your viewers are from, you will always be able to run your business smoothly. With Muvi, you also have the flexibility to bring-in and integrate your own choice of payment gateway or even accept payments in bitcoins or via operator billing, whatever you prefer best suits your business by requesting a custom integration from us. All the payment gateways and revenues collected from your audio streaming platform are directly linked to your bank account and you don’t share a dime with Muvi. Muvi also supports a Multi-Payment Gateway architecture, so you can use more than one payment gateway for collecting payments, this helps you in a multi-geography environment. With the ability to add and integrate multiple payment gateways, Muvi supports Multi-Currency billing and invoicing as well, this allows you to bill your viewers in their local currency. With Muvi you are not just converting the default currency rate to local currency, but you have the ability to set up different pricing for a single plan or content for each currency. So for the same audio track you can charge US $5.00 in USA & Canada, however you can keep the price as €7.00 for Europe or £6.00 for UK. Muvi comes with in-built tools for detailed Analytics and Reports to track the performance of your audio tracks, revenues, users and platform. Muvi’s Analytics & Reports helps you discover the real performance of each of your audio track enabling you to continuously strengthen your content. With Analytics, find which content is driving more revenue for your platform, higher engagement and optimize your platform by understanding your audience habits to bring-in more transaction / revenue to your business! Need to integrate with 3rd party analytics? No problem, simply request for a custom integration and you can further enhance your platform with analytics from 3rd party platforms as well. Muvi’s Audio Streaming platform comes in-built with marketing ready features like - SEO, Google Analytics & Webmaster Integration, Email Marketing and Newsletter capabilities, remarketing code deployments, Coupon Engine for offers & discounts and Voucher codes for 3rd party tie-ups and promotions. Need to localise your site content as per listeners preference and geo? With Muvi, you can enable multiple languages on your platform and talk to your listeners in a language they prefer. Muvi supports all language transcripts that have characters that are UTF-8 encoded and compatible, and you have the control to translate and upload multiple languages for your platform and tag them to geographies as well. We understand the need to Geo Block your platform or individual content from certain countries and regions which is why Muvi supports Geo Blocking at two levels - Platform level geo-block or content level. Both these kind of geo blocks have their own pros and cons, however the control is in your hand on how you want to configure the same as per your business dynamics. As an audio streaming platform, we know that you would work with multiple content partners, and they provide you with a huge library of content. Typically these partners expect a report in terms of how their content is doing on your platform and the kind of revenues they have made by providing you the same. With Muvi you now do not need to worry about the headaches involved in adding, managing and maintaining multiple partners, you can simply use our content partner portal and provide your partners a self-service access via which they can login and add/edit their own content and audio files as well as view reports and analytics on how their tracks are doing on your platform to looking at the revenue reports and see how much money they are making by partnering with you! All this works in real time, saving you all the headaches and hassles as well as precious manpower of managing multiple content partners..
Muvi is the only solution in the world that currently supports Audio Streaming, Live Video Streaming, Video On-demand (VOD) Videos, Live TV Streaming, Cloud TV Network Creating using Muvi’s Playout feature, as well as the ability to sell Physical Goods (eCommerce), merchandizing and products simultaneously on a single platform across Multiple Devices! Sell virtually anything with Muvi, from Videos to Music, from TShirts to DVDs, Muvi supports and manages it all, and thus allowing you to monetize your site and app traffic to the max potential! You can embed Muvi’s audio player and share it with 3rd party websites and apps. This means all your audio tracks, music, podcasts etc. can now be shared with either your group sites or the 3rd party sites you wish to share the content with. You can also restrict the “Share” option by domains to ensure that your audio player is not picked up and inserted into any unknown sites without your consent. The embed player also works on apps. With Muvi you get an “unlimited everything” platform, upload an unlimited number of audio tracks or files, you get unlimited and free storage*, endless bandwidth to scale with your listeners demand, unlimited users, unlimited transactions… with Muvi your platform will have no limits to grow! 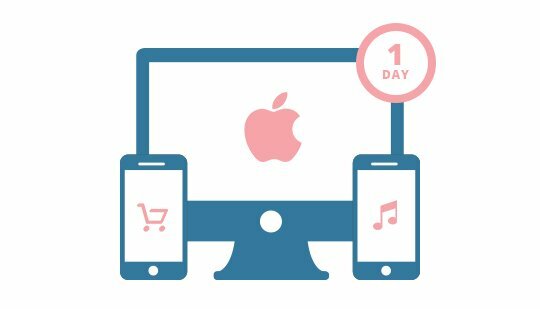 Build your Apple TV app, standalone mobile app for Physical goods or music can be launched within 1 business day. Yes, you read it right!